Decided to have some fun this week. I really did not think I would ever write a long blog about using this filter since I have used a very similar version with Photoshop CS5 for several years using the Adobe Pixel Bender interface.Pixel Bender includes Oil Paint as one of their filter choices (along with the cool Droste Effect – see my blog Pixel Bender Droste Effect). Oil Paint has always been a lot of fun but you can definitely tell you are using it. Photoshop CS6 has included it in their new version so I decided to give it another whirl since a lot of people seem to be really psyched by it. 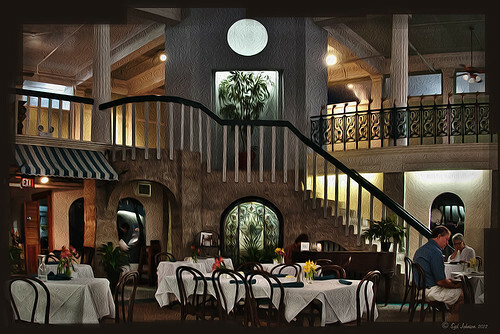 The image above is of the Cafe Alcazar, a restaurant that is located in the old swimming pool area of the Hotel Alcazar before it became City Hall and the Lightner Museum in St. Augustine, Florida. I might add it is one of the best places to get a great lunch, which is all they serve and at a reasonable price! While doing a CS6 tutorial, I was reminded that Oil Paint does a great job on detailed and HDR images – so this is what you are seeing. (Click on image to see more detail.) This was a bracketed three image hand-held shot that was first brought into Photoshop’s Merge to HDR using RC Concepcion’s El Capitan preset from his book The HDR Book, but any settings that work for your image are fine. After processing in HDR, the updated Lens Correction Filter was used to straighten the columns that were slightly bending in, and the image was straightened and cropped. A duplicate layer was created and converted to a Smart Object before applying the Oil Paint Filter so you can go back in and adjust your settings if you don’t like the results. The settings used were: Stylization 7.97, Cleanliness 4.8, Scale 0.84, Bristle Detail 6.9, Angular Direction 180, and Shine 1.5. Stylization : the bumpy texture slider – low value gives stucco effect (more realistic) and high value gives large brush stroke effect (default 4 with a range of .1 to 10). Cleanliness: sharpens the brush strokes – low value gives a gritty effect and high value gives super smooth effect (default 2.3 with a range of 0 to 10). Bristle Detail: depth of the brush strokes – low value creates smooth transitions and high value increases contrast (default 10 with a range of 0 to 10). Angular Direction: affects angle of the brush strokes and light hitting brushstrokes (default 300 with a range of 0 to 360). Shine: creates embossed look and keeps the curly strokes from being pushed up against the edge by creating lines around edges (major difference between this filter and one in Pixel Bender which cannot do this) – low value gives painterly look and gives similar look as Pixel Bender filter (default of 1.3 with a range of 0 to 10). For Pixel Bender users, Colorization: creates contrast and is different for each image (default of 1.18 and a range of 0 to 2) and Brush Contrast: set to 0 creates little contrast (default 1 with a range of 0 to 1). The Pixel Bender filter also has sliders for Stylization (default of 2.893 with a range of .1 to 10), Cleanliness (default 6.32 with a range of 2 to 15) and Brush Scale (default 2 with a range of .1 to 10) like the CS6 version. 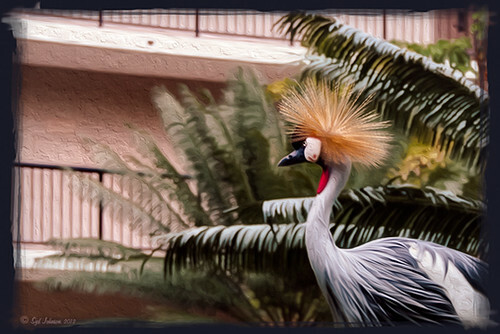 This bird is an African Crowned Crane that lives with two others at the Hilton Waikoloa Village Ocean Tower area. Since this filter is supposed to look good on pets and animals, I thought this image had the look for it. (The settings used were Stylization 2.08, Cleanliness 10, Scale 5.89, Bristle Detail 10, Angular Direction 302.4, and Shine 0.95.) It is taking a little time to learn what settings I like. It seems you have to watch the Shine slider or you get a way overdone look – but don’t completely eliminate it or you loose all the really cool texture as shown on the walls in the background and body of the bird. The filter effect seemed a little overdone in some areas (like the eyes, head feathers, beak area, and edges of the palms) so a layer mask was added. Using a low opacity brush, parts of the effect were brushed away. The image was finished up by adding a Curves Adjustment Layer to warm up the colors a little and add some contrast, and Nik Viveza 2 to add a little more detail and color to the eye, beak and head feathers. Overall I believe it turned out rather nice and it does add some artistic quality that the original image was lacking. To be honest, I do not see a lot of difference between the filters as created in Pixel Bender for CS4 and CS5 and for CS6, even though the sliders are somewhat different. 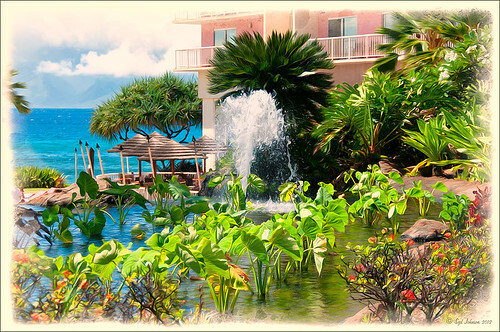 Below is an example of an image of the Ka’anapali Beach Club in Maui, Hawaii using the Oil Paint Filter in CS6. Then click on this image and you will see the original image as created in Pixel Bender CS5. These are the settings I used for the CS6 image above (Stylization 5.25, Cleanliness 10, Scale 1.29, Bristle Detail 1.85, Angular Direction 300.6, and Shine 0). These are the settings I used for the Pixel Bender image (Stylization 10, Cleanliness 15, Coloration 1.1, Brush Scale 3.07, and Brush Contrast 0.42). Both filters used a 69% opacity for the Oil Paint Filter layer and a layer mask was used to remove the effect from certain parts of the image. Also a Nik Color Efex Pro Brilliance and Warmth filter was applied to both images as a last step. The reason I listed all this information is that I think it is interesting to see how the two slider amounts compare. I found there were two significant differences: the use of the Colorization slider which has a big impact on how the color looks in the Pixel Bender image but is missing in the CS6 update and I think really adds to the image, and the Shine slider in CS6 which controls a lot of the crazy textures you get in the image – if you use too much, it gets really weird and some people don’t use this slider at all. By comparing the defaults of each filter, the CS6 settings seem to have been adjusted to fit what looks good on most images, or fine-tuned a little. 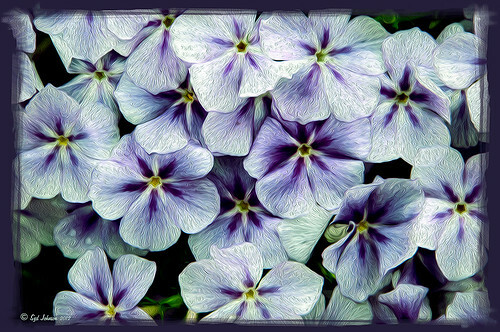 The above are small purple flowers in my front yard that I just had to try this filter on – I am surprised how nice it turned out. The settings for this image are as follows: Stylization 7.87, Cleanliness 7.5, Scale 0.6, Bristle Detail 10, Angular Direction 0, and Shine 3.3. The last step was to add a Curves Adjustment Layer to add some contrast and bring out a little bit of color in the flowers. This entry was posted on 06/09/2012 by sydspix. It was filed under Photoshop, Photoshop Filter and was tagged with Adobe Pixel Bender, CS6 Oil Paint Filter, Oil Paint Filter, Photoshop Oil Paint Filter, Pixel Bender.